Today I bought our third stroller. I know, it sounds crazy. 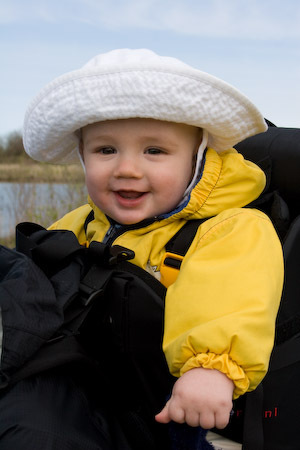 But strollers are like shoes: could you pick one pair of shoes that would work for all situations? It would be hard. Same with strollers. We have our Chariot, which we love dearly, a bike trailer/stroller/jogger combo, made in Calgary and extremely well thought of. You barely need to push it and it works wonders to prevent cabin fever, as it protects your little one perfectly well into the pouring Vancouver rain. We have our Graco travel system, which was great for carrying the baby car seat (to the Co-op car, for instance), but the stroller is really not that good and a little too big still to take easily on the bus or shove in the trunk for “maybe” purposes. So today we splurged. I’ll let you know how I like the stroller. But I’m convinced it will prove to be invaluable. I’d better hope so, with the money we spent on yet another baby item! Oh, and as a side note, like most new things we purchase, it stinks! It’s airing out on the balcony right now. Luckily it is for use outdoors, so it shouldn’t matter as much! I have to congratulate a neighbour of mine who recently gave birth to a 9,5 pound baby… at home! No epidural, no pain killer of any sort, a completely natural birth. True, I had a completely natural birth too, but my baby weighed a mere 7 pounds and it was already more painful than anything I could have imagined. Her baby was a third bigger than mine! I know, you don’t want to picture that either. I just wanted to tip my hat to her. And hope it never happens to me! “They” say that the first six weeks of the life of a baby are the toughest. If you want my opinion, “they” don’t know what they’re talking about. My father-in-law came to help us for a few days after our boy was born. My mom stayed with us for two weeks. My husband took 6 weeks off. During that time, all I had to do was breast-feed. Sure, it was a bit boring and my bum did hurt from sitting on the couch for so long, but things were relatively easy. I could read or doze off while I was breast-feeding. Someone else was doing laundry, taking the dog out and cooking supper. When Elliot cried, I fed him. If he was still crying, one of us rocked him or carried him around. When I was hungry, someone had cooked supper. If we were trying to eat and the baby cried, we ate one after the other. Sure, I was up a lot at night, but I also slept a lot during the day – as soon as Elliot napped, I went down too. Fast forward to now. I haven’t had a full night of sleep in more than eight months, and it’s definitely showing. During the day, Elliot never naps for more than an hour (and it’s more often 30 minutes) and I gave up on sleeping when he does because I find it too frustrating when 8 times out of 10 he wakes up just as I had finally managed to fall asleep. There is laundry, dishes, meals to cook, purees to prepare, and all the thinking about what needs to be done next. Breast-feeding takes a lot less of my time, but it has been replaced by following Elliot around trying to make sure he doesn’t crack his skull open on everything he explores. I can’t leave him alone, even to go to the bathroom, without fearing what he’ll do next. Sure, we have baby gates, but there isn’t enough storage in our apartment to keep everything that he’s not allowed to touch away from Elliot. So I keep having to say “No!” and take stuff from him, which frustrates him and makes him grumpy. At night, I still get up once to breast-feed. Often, though, Elliot wakes up one or two more times, and it takes a while before he falls back asleep (not to mention us). When he was first born, we knew we had to respond promptly to every cry and feed him on demand. Now, we keeping worrying about wether we’re letting him cry for too long (but he has to learn to fall asleep by himself), wether he’s getting enough variety in his food, or wether he needs some new toys to stay stimulated enough. I used to carry him around in a sling. Now he’s too heavy, of course, and in his stroller he often has meltdowns that I cannot calm. I’m sore all over from carrying him and picking him up from the ground. He refuses to lie on his back for more than a few seconds, and every diaper change means a lot of crying and a big fuss trying to pin him to the change table while I hurriedly wrap the diaper around him and do up a few snaps. Does killing fruit flies bring bad karma? If killing fruit flies brings bad karma, I’m in for some awful luck. As Sophie wrote earlier, when I opened our balcony worm composter this weekend to feed the little squirmies, I unleashed the wrath of thousands of angry fruit flies. It was not quite Alfred Hitchcock’s “The Flies Birds” but it was definitely on par with hiking through the alpine on a warm breezeless evening and being swarmed by a thick cloud of misquotes and black flies. In the end we did not opt for creating a friut fly circus, we already have enough trouble with our cat, dog and baby circus – currently showing 7 days a week. Nor did we opt for a catch and release strategy – though we could have released them into our neighbours compost bin; sorry Andrew, it’s payback for the fruit flies you gave us last year! Alas, sadly, in the end we are barbarians, we opted for a mass culling. If someone ever told me that I would would spend an evening vacuuming up fruit flies off the walls and furniture of our deck, I would never have believed it. Sure I can understand having to hunt down and squish a few fruit flies in the kitchen and bathroom but having to vacuum them up is a little bit extreme. The worst part is that apparenlty it can take up to several weeks of vacuuming flies before the population is back under control… good times! Evidently, the solution for never having to vacuum fruit flies off of everything you own, is to ensure that your compost is burried deep enough and freeze or breifly microwave your composting material before feeding it to your worms. I think I will follow that advice a little closer, once this is all over…. Yesterday, for the first time in a long while, we managed to get out of the city for a (too) short visit to the boonies. We went with some friends to the George C. Reifel Migratory Bird Sanctuary, in Delta, to breathe some fresh air and do some bird watching on a beautiful sunny day. I don’t think Elliot really notices the birds yet, but he seemed to enjoy the walk on my back (Daddy was handling the camera for most of the way, so I was bearing the load). And when we stopped for a snack, he had a chance to stretch his legs and climb on something new: the metal fence of a viewing platform. We had a wonderful day and I can’t wait to go back when Elliot is a little older. Although we may have to tie him up so he doesn’t run after the birds! Do you want to pet my fruit fly? But the funniest thing was when Zak searched the Internet to try and find a way to get rid of them. He found a site advocating “humane” ways to get rid of flies: trap them in a jar with a banana in it and release them into the wild once a day. Fruit flies! We’re not talking about seals here, or even pigeons. They’re fruit flies! We can’t even kill fruit flies without guilt nowadays? Maybe we should tame them and build a fruit fly circus. You never know, maybe that’s the money-making scheme we’ve been looking for! I am going back to work in less than 4 months now, and although it may seem like it’s still ways away, I know it will be over in the blink of an eye given how fast the past 8 months went by and given that we have tons of projects for the summer. We still don’t have a spot in day care for our son, and likely won’t by the time we need it. So we need to either find a place in a family day care, or one of us would have to stay home. Which is why we need a genius idea. There seem to be tons of people who come up with a seemingly so simple idea, grow it into a profitable company, get bought out by Google, Microsoft or another major corporation and retire wealthy. We need one of those great ideas so that one of us can stay home with Elliot and yet make enough money to allow us to keep a decent standard of living. We’re still thinking… If you have one of those crazy good ideas and wish to share, don’t hesitate!